In the south of India is a fairly long river. It runs through four states, after all. Three states and a Union Territory, more like, though that’s only a spec. And when it doesn’t quite rain very well in the country, the states go at it in the ring. 2012 is one of those dry-ish years. Monsoons have been down by nearly 50% in the country. And all states are feeling the heat a touch. But it would appear that most affected is Tamil Nadu – one of the states through which the Kaveri runs. And since they don’t have much water to farm, or drink, they asked their Kannadiga neighbours to help out a little bit and send in some water from their side of the river. It would turn out, though, that Karnataka believes that the river belongs to them. That they own her. And that they have undisputed rights over it. Hence, they have refused to be the good samarita ns. The PM and teh Supreme Court, however, have asked them to stuff it and send out 9,000 cusecs of water to Tamil Nadu every day. 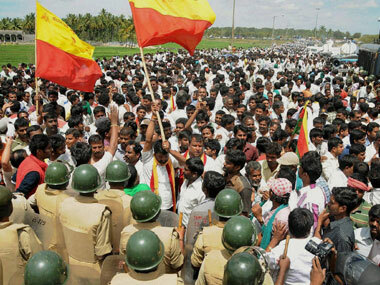 This has led to protests on the streets and a statewide bandh being called on Saturday, October 6. I don’t have a conclusion planned for this post. There is none. You know what a bannequin is? Menstruate at your own risk. Period. enter your email address to get all new posts by email.